The other day while meandering through Mong Kok I stumbled across a little old lady standing in a tiny alley selling a plastic hand-held dumpling maker that promised to make perfect dumplings every time. And it being only HK $10, I just couldn’t resist buying it and taking it home to try out. First step — you take her out and treat her like a lady. Just kidding. Season lean pork and shrimp (all chopped) with finely chopped onion, garlic and ginger, with a bit of salt and pepper, and chopped water chestnuts. Season with Chinese cooking wine. Second step — grab the dumpling maker, and one of the dumpling skins. 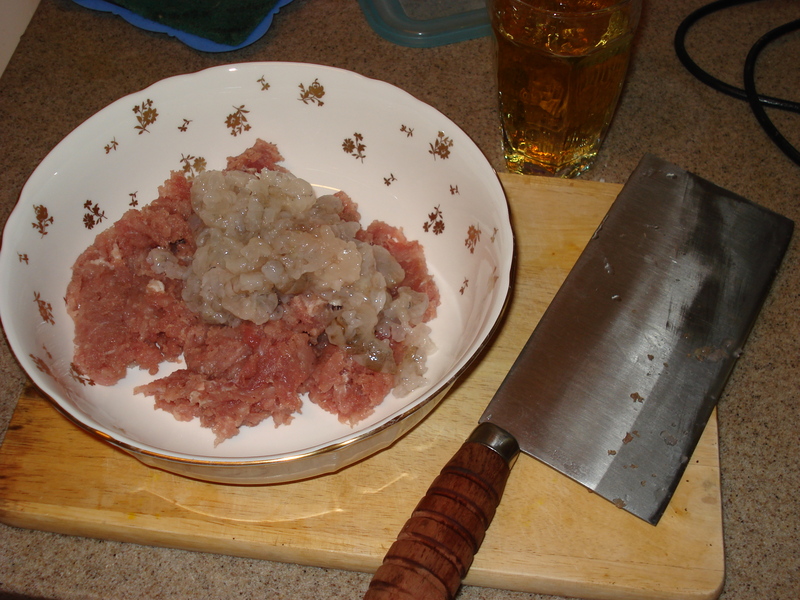 Third step — spoon some of the meat into the middle of the skin…. … and squeeze it together as hard as you can. And finally — ta-daaaa! A perfect little dumpling! Frying method — heat up some sesame oil in a pan (sesame oil is crucial — do NOT use olive oil for goodness sake) but not too hot because it burns quickly. Put the little suckers in, and cover. When they start to get a bit crisp on one side, add in a little bit of water. This will steam them. After about a minute, turn them over and let them crisp on the other side. Alternative method — you could also make them into a soup. Just need some basic stock and some veggies. In this case we used whatever was available: onion and brussel sprouts. Final product — what do you think? Do these babies look perfect or what? The verdict — No self-respecting Chinese person would use the dumpling maker tool because it is I suppose the easy way out. But for me, that $10 was well spent. wow you found a perfect tool for dumplings! What is the soup one? Like Suigyoza? I love it! I need one of those, we are so addicted to food from your part of the world. We found 2 decent sushi places nearby, little holes-in-the-wall, but it’s not nearly as good as our down-de-islands-fresh-fish-homemade-sushi. Sigh! Maybe we could start making dumplings?